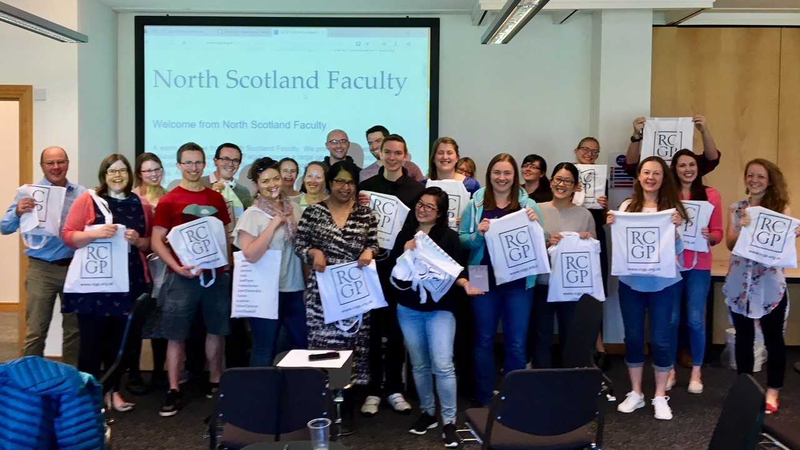 The education season for GPST3’s got off to a flying start at Centre for Health Sciences in Inverness this week. The course began with translating emergency situations in primary care for GPs. Dr Alison MacLeod ED consultant and her team delivered a great ‘hands on’ start to Day 1 with 6 facilitator led scenarios - meningococcal septicaemia, asthma, trauma, gastroenteritis with shock, status epilepticus and choking. No mannequins were harmed in the session and all survived, growing up to take up medical career choices influenced by the positive experience of the care they received. The 2 days progressed to a paediatric masterclass with sessions around Feeding, Allergy and Nutritional problems in Children, General Paediatrics for the GP and case-based Community Paediatric problems. Day 2 was enhanced by local RCGP faculty support and sponsorship providing refreshments, lunch and goodie bags (as pictured above). On day 2 we received 2 great sessions in Orthopaedic and ENT problems for GPs, interactive sessions with time to ask all the questions we need to ask and address all the learning we didn’t know we didn’t know. In starting off the training year Day 2 was further enhanced by a getting started session for CSA preparation. ‘The Journey Begins…’ presented and led by Dr Neil Bennett, GP and CSA examiner. A successful start and enhancement to the final year of GP training in Primary Care. More of the same to follow in December, January and April as the finishing school approach takes shape for the Caledonian & Rural Track Training Programme for GP training in the North of Scotland.